Upon the release of the iOS 6 developer beta, one of the most obvious changes that was noticed was a revamp in the iTunes app. Specifically, the iTunes U, Podcast and Audiobooks categories were removed. The removal of these sections has prompted the speculation that Apple plans to make separate apps for these sections. 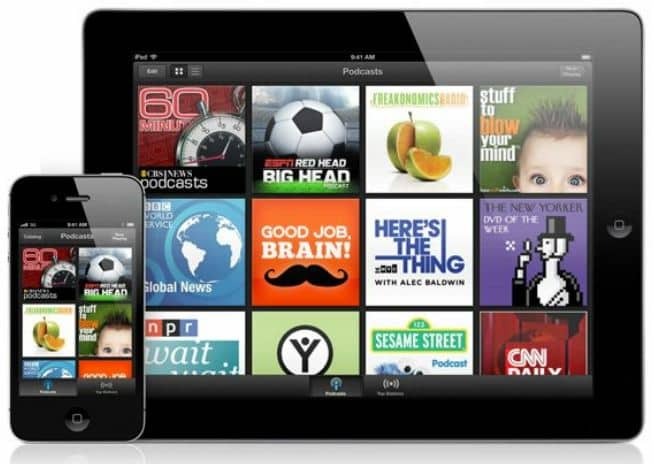 And with Apple quietly releasing the Podcasts app, those speculations have been confirmed. The new Podcasts app will work on iOS devices that run iOS 5.1 or higher. When you open the app, you will see all of the podcasts you subscribed to and presented in a grid pattern. If you don’t find the block grid default layout attractive, you can view the podcasts on a list view for an even faster and easier access to both audio and video podcasts. One of the new features of the Podcasts app is Top Stations. This new feature will allow you to browse through the podcasts based on genre and then on subsets within the chosen genre. The Podcasts app is very well designed and has a lot of eye candy. The app comes with skeumorphic design elements that make it really nice to look at. For example, scrolling through the Top Stations shows a graphic that is quite similar to radio dials. The podcast player, on the other hand, looks like a reel-to-reel player – and the reel speed will vary based on the playback speed you use. The Podcasts app is now available for download. I guess it’s just a matter of time before the iTunes U and Audiobooks apps pop up in the App Store. You do realize that an iTunes U app has been available since April of this year, right? AT LAST!!! So far, it’s looking good, all my podcasts in one place AND with an automatic update download! It’s been a long time coming Apple!!! Thanks.